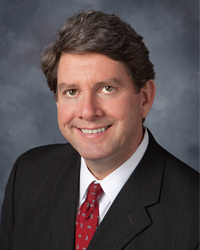 On April 23, 2012, Jonathan W. Groessl joined the Janesville law firm of Carney Thorpe, LLC. Mr. Groessl worked in the transactional area of another local law firm for over 20 years prior to joining the Firm. Before moving to Janesville, Mr. Groessl worked in the Business Combinations areas for an international accounting firm. He then worked in the mergers and acquisitions area of a Connecticut private equity firm, and after they acquired a major heavy equipment and truck trailer manufacturing concern he acted as Assistant General Counsel in Michigan for several years. A Wisconsin native, Mr. Groessl concentrates in the areas of corporate, real estate, construction and business law. Mr. Groessl obtained his education at the University of Wisconsin-Madison where he graduated with a BA in 1982, and a MBA in 1983. He then worked in Milwaukee for several years in the finance area before graduating from DePaul University College of Law in 1988. He is a member of the State Bars of Wisconsin and Michigan, and the American Bar Association. Mr. Groessl is active in Forward Janesville, Inc., the Rock County Historical Society, the National Stroke Association, and the Rock County Bar Association. He is the former president of the University of Wisconsin-Rock County Foundation, Inc. He has also chaired both the Janesville Morning Rotary Annual Pie Ride for several years, and the American Heart Association's Heart Walk.